Special #6 consists of a bulk quantity of Official Area 51 Alien Drivers Licenses. 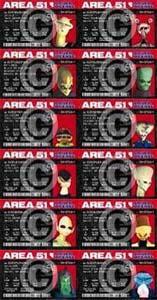 Twelve (12) different Official Area 51 Alien Drivers License, with a maximum of 30 of any one item. Free USA shipping on all quantities. Orders processed within 48-hours and shipped First Class mail. Actual size of each Alien Drivers License is 2.875" wide by 1.75" - Same size as ordinary U.S. Driver License. Retail price per Alien Drivers License is $9.95. Our regular price is $4.95 per, this special sells 325 Official Area 51 Alien Drivers Licenses for only $958.75 (this equates to only $2.74 per unit in quantity, delivered free in the USA).